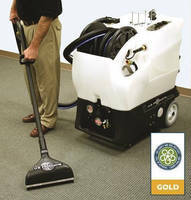 The King Cobra 1200 from U.S. Products is perfect for cleaning both carpet and hard-surface floors. The system includes a built-in vacuum/solution hose reel with 25 feet of vacuum hose as well as an inline heating element for cleaning carpets with heat up to 212 degrees (F). This is a low-moisture system, so it is fast drying and offers less chance of shrinking and less wicking. For hard-surface floor cleaning, the King Cobra 1200 delivers 1,200 psi of pressure, power cleans and rinses floors, and has an auto-fill/auto-dump system to ensure continuous cleaning operation. For more information, visit www.usproducts.com or call toll-free: 800-257-7982.